Just a few years ago I was attending professional conferences wishing I had something interesting enough to talk about to be a speaker. I found myself wishing the topics were more relevant to the work I was actually doing. I often felt like the content was a few years behind what I was reading and following in other parts of the country. I didn’t feel like I had anything of value to share with my colleagues, and I certainly didn’t consider myself an expert. Over the past year I have transitioned from that attitude to regularly being asked to speak at a variety of trainings and events. The following are things I learned about making that transition and why SPEAKING UP is key to career development. I was ready to share my experiences well before I thought I was. My thoughts were valuable because I was in the trenches doing the work, and the challenges I experienced were absolutely shared by my colleagues. If you poll a handful of colleagues and they seem interested in a topic, it will most likely be relevant to many. Conference committees are searching for people willing to talk about real issues. Coming up with speakers is the most challenging part of putting a successful event together, especially at the local or state level. Larger national conferences usually do a more formal call for sessions, but it is still fairly easy to respond to that call and get selected with a well thought out topic. I didn’t need to be the expert to be the presenter. While having some relation to the topic is certainly necessary, being willing to research and be a little creative is actually all that is needed. I have become a much stronger employee through putting together conference sessions. My own skills and understanding have been honed by preparing to teach others. Being the speaker opens up networking opportunities. I come to life when I speak to a group, but I am incredibly introverted when it comes to approaching another professional I admire and starting a casual conversation. I find when I do a session, others will approach me, making it easier for me to build connections. Having a reputation for being dependable as a speaker matters. After planning a few conferences, one of my biggest fears is a great speaker who flakes out at the last minute. This is an easy one, but simply being reliable is a great asset to the conference planner. Speaking more makes you a better speaker. If you are not yet in a position to regularly present to council, getting speaking experience is critical. Great speaking skills are valuable in local government. 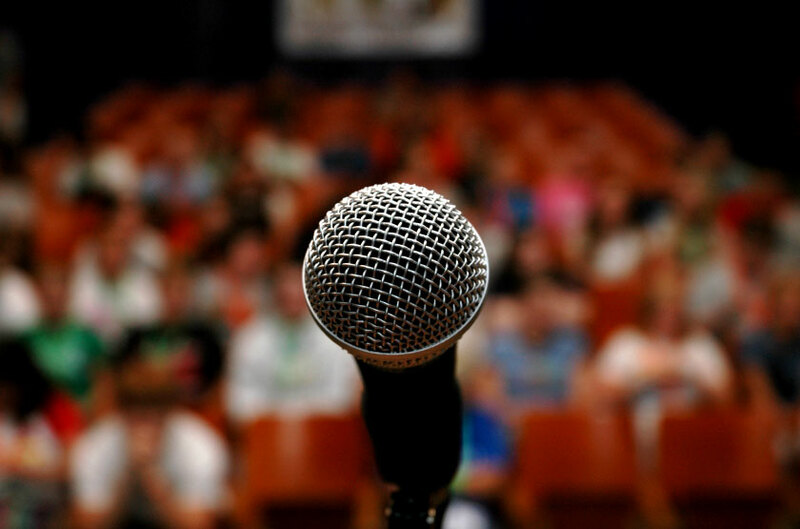 Successful speaking engagements validate experiences and build confidence. Speaking is an easy venue for career building. A side effect of being willing to speak is name recognition. My last two positions came from direct referral from someone who knew me. So to those who are early their careers (I am 30) and trying to make the transition to leadership, utilizing speaking opportunities is a great tool. The rush I get from getting in front of a group of people and talking about something I care about is addictive. Its a vicious cycle of committing to an event, anxiously outlining my presentation, and presenting. I alway feel so alive after speaking to a group of people and can’t wait to do it again. What do you think about jumping in and being the speaker? Are you ready? I’d love to hear how you feel speaking has helped you in your career. Tweet at me!